In Victorian England, with the country swept up in the Industrial Revolution, the Pre-Raphaelites, close to William Morris’ Arts and Crafts movement, yearned for a return to bygone values. 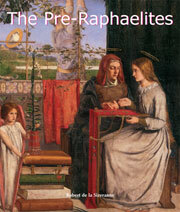 Wishing to revive the pure and noble forms of the Italian Renaissance, the major painters of the circle (such as John Everett Millais, Dante Gabriel Rossetti and William Holman Hunt) favoured realism and biblical themes over the academicism of the time. This work, with its captivating text and rich illustrations, describes with enthusiasm this singular movement which notably inspired Art Nouveau and Symbolism.